* Vetiver is a green grass with earthy, woody, and smoky qualities. The top notes are green, but not really bright, and sort of muddle with clove. * The Bois 1920 line was launched in 2005 when Enzo Galardi began reinterpreting his grandfather Guido’s original formulas. * A hint of amber starts to peek through the green in middle development. It’s light and reminds me of the modeling clay that I played with as a child. * As an Eau de Toilette, the strength is moderate, and it would make a great office-friendly scent. * In the dry down, the amber becomes the focus. It’s not a bold amber- more light and powdery. * Although this is in their men’s collection, it could easily be worn by women. Summary: Vetiver Ambrato is exactly what the name suggests. While it doesn’t blow me away as life-shatteringly amazing, it is a high quality fragrance that will work for many as a safe, office-friendly fragrance. 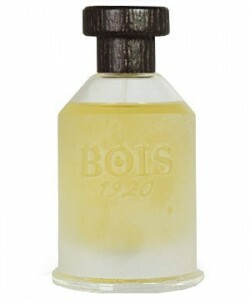 Bois 1920 Vetiver Ambrato is available from Luckyscent, MIN New York and select independent boutiques. Thanks for your comment. I’ve realize that the more I explore fragrance – the more I realize that I am just not a fan of vetiver.